Compact and generous with its ultra-soft natural hair, it smoothes the bronzing pigments perfectly over the skin for an even, luminous and skin-embracing result. It's the guarantee of a flawless tan, without leaving any marks. Nomad, elegant, it fits in all bags for a new touch in the day, well protected in its bronze velvet suede bronze pouch with magnetic closure. Application: Sweep the raised areas of the face, the places that catch the sun most. Using a bronzing powder brush, apply your Terracotta powder by tracing a figure "3" on each side of the face to enhance the tan: from the forehead down towards the cheeks, then down along the jaw line to the chin and down the neck. For the finishing touch: don't forget the top of the nose. 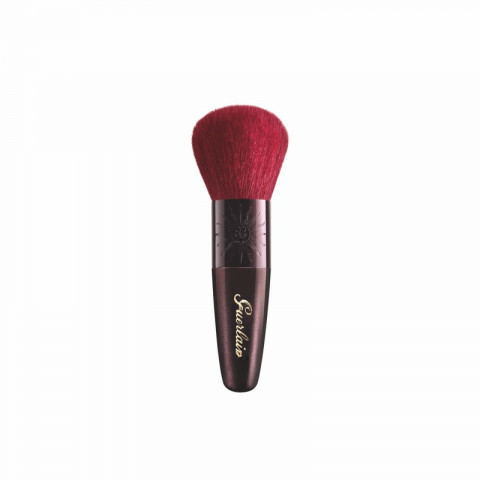 super fluffy and soft brush to use for bronzing. i like to use this with the guerlain terracotta bronzers to add an overall sunkissed glow to the face. I found this brush scratchy on my sensitive skin. There are better brushes on the market for a fraction of the price! So far my favorite brush. I use for powder it's extremely soft!